“In London’s restaurants you can find virtually every cuisine in the world.” This statement appears so often and in so many places nowadays that it has taken on the grubby patina of a tired old cliché. Even if it is true, it is of no interest to me. Variety means nothing: quality means everything. Still, my most recent sighting of these words did prompt me to start thinking about where I should go, in my capital city, to eat the one variety of food which is remarkable for its absence from most restaurant menus. Where, in other words, could I find good British food? I thought and thought, and then the answer came to me. 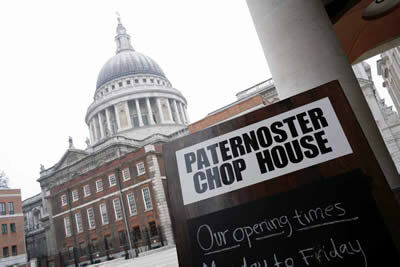 I booked a table at The Paternoster Chop House. I decided to dine early, for I am a fan of choral evensong and my destination was but a hop, skip and a jump from the portico of St Paul’s Cathedral. It would therefore be Evening Prayer at five and dinner at six. As the canticles wafted up into the dome and the teenage tourist in the canon’s stall next to mine whispered and fidgeted, my mind wandered to the meal in prospect. 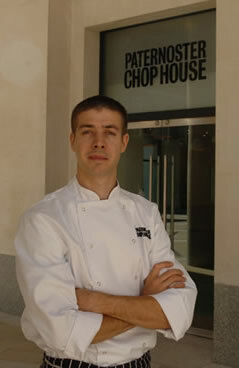 I knew that the chef, Peter Weeden (pictured), had a reputation for seeking out not only old British recipes, but also small suppliers of top-quality ingredients. The idea of suckling pig from Lancashire and fish brought daily from the ports on the South Coast pleased me. Byrd’s Miserere dipped and soared, and soon I was out into chill air and striding across Paternoster Square. This square used to be one of the vilest manifestations of the architectural brutalism of the 1960s. ‘Hideous’ would have been far too kind a word for it. Now it has been rebuilt in the style we call post-modern. It is easy on the eye and has a certain knowing elegance. Stand in the square and look back to the cathedral and you will have one of the great sights of London: Wren’s masterpiece, partially obscured, soaring confidently towards Heaven. Indeed, you need not stand, for The Paternoster Chop House has some outside tables, at which you can sit, eat, drink and gaze the evening away. I decided, however, that it was too cold for alfresco dining. I went in through the glass doors and found myself in the space designed by Sir Terence Conran. 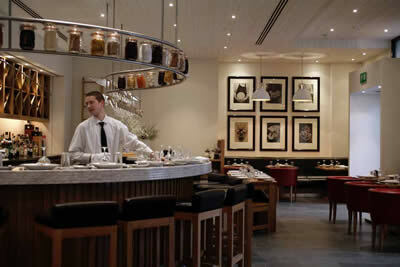 Here were banquettes of red and brown leather, bentwood chairs, grey slate, modern paintings, spotlights and waiters in aprons. The bar to the right was crowded with folk (mostly gentlemen) relaxing after work. At the far end of the room, in the open kitchen, the cooks were busy with their grills and spit roasts. I decided upon a corner table, lowered myself onto the banquette and felt that a good meal was in prospect. Soon William McKechnie was standing before me. Mr McKechnie is the Assistant Restaurant Manager and is full of smiling enthusiasm. His careful efficiency meant that the service I received throughout the evening was of the highest order. 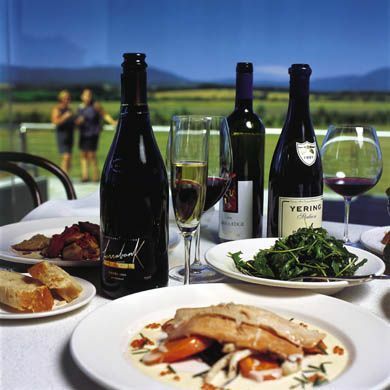 He persuaded me to begin with a glass of sparkling – and remarkably creamy – chardonnay from Sussex (Nyetimber, 1996). I began to appreciate that they take their commitment to Britain seriously here. Wine can be had from most parts of the world, including, as I have noted, the British Isles. Prices start at £18 for a Sicilian chardonnay and go up to £325 for the 1985 Mouton Rothschild. Many of the 200 offerings are in the £30 to £50 price range. Bottles which caught my eye included 1995 Krug champagne (£210), 1992 Grange from Australia (£250), 2001 Tignanello from Italy (£85) and the 1983 vintage of that always reliable claret, Cos d’Estournel (£120). I decided to go to Burgundy for both my white and my red and was delighted with the results. My 2004 Puligny Montrachet was wonderfully elegant, with harmonious notes of sherbet and toast (Paul Pernot - £67.50), and my 1999 Gevrey Chambertin was soft and accessible, with plenty of red fruit and just a tiny hint of the farmyard (Louis Jadot - £65). I left the restaurant in good heart. I looked up at St Paul’s and paused to consider why I had enjoyed my evening at The Paternoster Chop House so much. 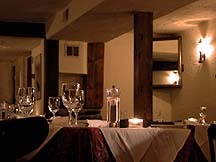 Good British food, fine French wine, comfortable surroundings and friendly service. For what more can one ask, in dear old London town? Warwick Court, Paternoster Square, London EC4N 7DX, England.